Odrive is a folder to everything online. Download and install odrive on your mac or pc. You will get a folder to all the things you use online. For example, open the Facebook folder to get all your pictures. We currently support Facebook, GoogleDrive, Instagram, Microsoft OneDrive, Dropbox, Gmail and Windows and Linux file servers. Box, Salesforce and Mac file server are next, and many more to come. Your digital life is strewn all over the Internet, in multiple applications and services. 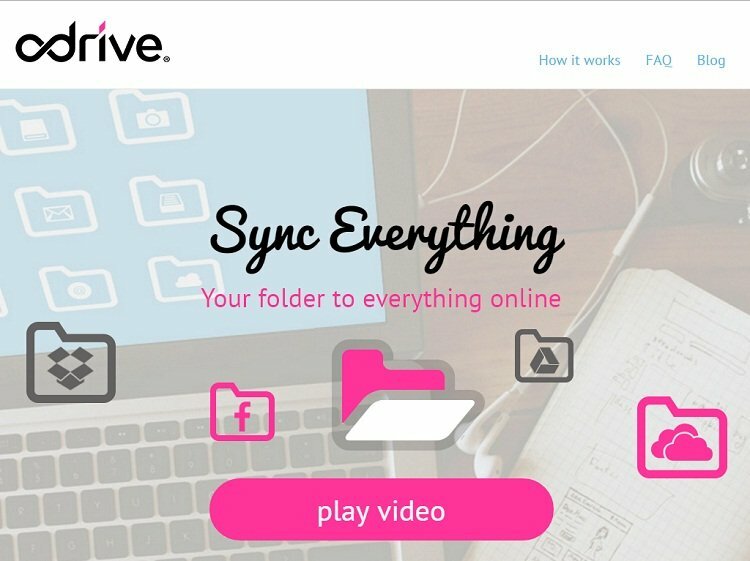 With odrive, all your online files can now live in a folder on your desktop. The landscape has changed. No vendor can lock down a user. The cloud is about using everything. odrive simplifies the cloud by making everything available in one folder on your desktop. odrive puts the user at the center with access to all platforms. What is different from Dropbox? Instead of uploading all your content into one place (i.e. Dropbox), keep all your stuff on whatever platform is best and access it all through odrive. Are you competing against Dropbox? No. We are taking what users like about Dropbox – sync folder to access files – and applying it to everything else that’s not already in Dropbox. Users will choose the application that allows them to access their data in the way they want it. Why would someone want to use Odrive instead of Dropbox? If you have content in different applications, odrive will provide a unified interface to all your content. If you have a lot of content, odrive’s Progressive Sync will provide you with a superior experience to all your content, even that residing in Dropbox. Progressive Sync makes it possible to sync everything. It doesn’t matter how much content or how many sources are involved. Progressive sync automatically syncs just the files you need from multiple source. Progressive sync is the enterprise technology ported from Oxygen Cloud to odrive. Odrive is founded by Peter Chang, a serial cloud entrepreneur who also founded enterprise software companies Oxygen Cloud and LeapFile over the last decade. The core Odrive team has been working together for years. They are a seasoned group aiming to disrupt the industry by simplifying user access to all files online. They are headquartered in Redwood City. For more information, you can check them out at http://www.odrive.com/faq.html. Otherwise, you can check out my top 5 personal cloud storage providers.